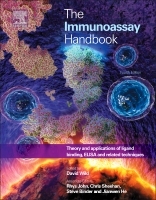 Welcome to the website for Wild, D: The Immunoassay Handbook: Theory and applications of ligand binding, ELISA and related techniques, 4th Edition. This website provides more information about each of the 77 chapters in the book and their authors, and color versions of some of the figures. For a beginner’s guide to immunoassay, take a look at this free downloadable introduction from The Immunoassay Handbook. In March 2015, some of the authors have provided new content on this website about the latest developments since book publication. Corrections have also been documented for three of the equations in Chapter 2.1. Click the link to the Chapter Pages below. 3.2 Inductively Coupled Plasma Mass Spectrometry-Based Immunoassays, with reference to excellent review by Liu et al. The fourth edition of this award-winning reference work provides an excellent, thoroughly updated guide to the science, technology and applications of ELISA and other immunoassays, including a wealth of practical advice. It encompasses a wide range of methods and gives an insight into the latest developments and applications in clinical and veterinary practice and in pharmaceutical and life-science research. Highly illustrated and clearly written, The Immunoassay Handbook provides an excellent guide to this fast growing field. Revised and extensively updated, with over 30% new material and 77 chapters, it reveals the underlying common principles and simplifies an abundance of innovation. The Immunoassay Handbook reviews a wide range of topics, now including lateral flow, microsphere multiplex assays, immunohistochemistry, practical ELISA development, assay interferences, pharmaceutical applications, qualitative immunoassays, antibody detection and lab on a chip. This handbook is a must read for all who use immunoassay as a tool, including clinicians, clinical and veterinary chemists, biochemists, food technologists, environmental scientists, and students and researchers in medicine, immunology and proteomics. It is an essential reference for the immunoassay industry.